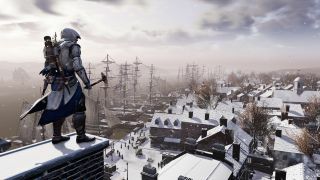 As we've come to expect from the earlier games in the Assassin’s Creed series, there are a number of feathers - 50, to be exact - spread across the Frontier area in Assassin's Creed 3 just waiting to be collected, with most of them found up in trees sitting atop a nest. When you start closing in on the location of an Assassin's Creed 3 feather, listen out for the chime sound it makes then use that to hone in on its location. Once you've spotted it, if it's up a tree you may need to trace a route back through the branches to a point where you can climb up, then hop along to branches to reach it. We've broken down the Frontier into individual areas below, complete with a map showing all the feather locations in that area, which you can expand by clicking the icon in the corner. If you're taking a trip back to 18th Century Colonial America in Assassin's Creed 3 Remastered then this is the perfect opportunity to grab all 50 of those feathers and collect the new outfit that will be waiting for you in the basement of the manor. Once you have collected each of the 50 feathers from the Frontier, you won’t receive an Achievement or a Trophy for your troubles, but you will receive a new costume that will be available in the basement of the manor.